For other types of plank houses, see American historic carpentry. 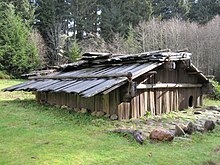 The oldest plank house village found is located in Kitselas Canyon at the Paul Mason Site in western British Columbia, CA. This village is estimated to be 3000 years old. At the Maurer site in British columbia the remains of a rectangular building have been excavated, providing artifacts which date the site to between 1920 and 2830 BCE. Due to the nature of this building material, the anthropological documentation for these people is not widespread. The manner of wood harvest and continued use of that harvest was purposeful and sustainable. Native people of the Pacific Northwest maintained a distinct respect for cedar and the value it had held for many generations. Cedar logs compose the primary support system of the plank houses of the Pacific Northwest Indians, and are clad with thick cedar planks harvested from living trees. Cedar trees have a straight grain with very few knots and have good weather resistance. The straight grain enables the separation of planks of wood from the tree. Craftspeople would insert a wedge to separate a section of wood through the height of the tree and removed it with an adze at both ends. This harvest method was sustainable and enabled the people to use the wood and to have a supply of planks to rebuild in another location. The patience of the people is evident in the practice of leaving the wedge in place to continue the pressure that would enable another wedge placement further up, creating longer planks. 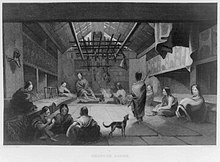 Interior of a Chinookan plank house, illustration by Wilkes in the 1850s. Many important details are seen here, including the use of a plank floor, a large, central hearth, sleeping and storage bunks, and the drying/smoking rack above the fire. There is also a dog, and a musket propped in the rear left corner. The cedar ropes that secured the planks to the uprights and beams allowed the people to deconstruct their homes and bring their planks with them to the next location. These planks were neither small nor easily obtained, but they were valuable assets and, as such, they were transported with the household goods during the seasonal migrations. The house frames were left intact until the next season, when the people returned and reattached their traveling planks and reconstructed their home. There were two distinct roof types found in this region. Both types are placed on a rectangular house that has a hearth or fire pit. One type consists of gabled, paired ridgepoles, vertical walls, and roof planks with an interior pit that was reached via steps. James Cook described the shed roof structures on Vancouver Island and around Puget Sound. 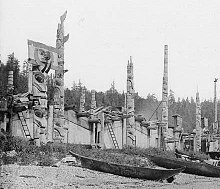 His description is that of a cruder type of building that may have been in the adaptive stages of the house type possibly brought to the coast by the Salish people, who modified as needed with the change in location. These shed roof houses are the largest constructed anywhere in this region. The articles that have been written by anthropologists describe the shed roofs as being shed type that are not consistent in description as to the roof pitch. One informant will state that the roof was slanted to the back of the house, and another will say it was pitched to the front, or the side of the house. The roof pitch was adjusted according to the direction from which the rain comes down. Regionally, the rain comes from the south. In 1778, during his third mapping voyage, James Cook described the homes he saw at Nootka Sound as not having a door. He described irregular openings through which the Indians passed in and out. The "Old Man House" had a maze "consisting of a series of parallel walls partly uncovering each other, around which the visitor had to pass." The maze ended in a dark area that housed the fire pit. One explanation for this configuration was as a defense against intruders. Alternately, because the lack of doors and the cedar mat room dividers did little to keep the wind and rain out, the mats may have served as windbreaks. Anthropologist Ronald Leroy Olson, whose subjects were the Quinault, Tlingit and Kwakiutl tribes, defines the coasts of the Pacific Northwest as the place for rectangular plank houses, from the coastal region of British Columbia to the mouth of the Copper River in Alaska with one exception; the Athabascan Tseutsaut of the head of Portland Canal, who used temporary brush and bark lodges. The Alaskan people are more likely to use spruce wood, which has characteristics similar to cedar, due to the availability of that resource. Cedar was the material of choice for the coastal people of southwestern Canada, and Washington, Oregon, and Northern California. ^ "Cedar: Tree of Life to the Northwest Coast Indians," by Hilary Stewart describes and illustrates the harvesting of individual planks from living trees. Photographs of Indian houses, camps and villages. Late 1800s to very early 1900s.